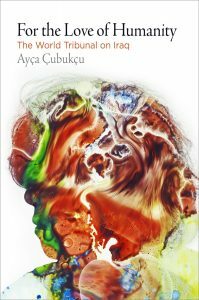 Featuring author Ayça Çubukçu (Associate Professor in Human Rights, Co-Director of LSE Human Rights Department of Sociology) with discussants Anthony Alessandrini (English KCC, CUNY) and Vesuki Nesiah (NYU). Moderated by Gary Wilder (Anthropology GC, CUNY). On February 15, 2003, millions of people around the world demonstrated against the war that the United States, the United Kingdom, and their allies were planning to wage in Iraq. Despite this being the largest protest in the history of humankind, the war on Iraq began the next month. That year, the World Tribunal on Iraq (WTI) emerged from the global antiwar movement that had mobilized against the invasion and subsequent occupation. Like the earlier tribunal on Vietnam convened by Bertrand Russell and Jean-Paul Sartre, the WTI sought to document—and provide grounds for adjudicating—war crimes committed by the United States, the United Kingdom, and their allied forces during the Iraq war. For the Love of Humanity builds on two years of transnational fieldwork within the decentralized network of antiwar activists who constituted the WTI in some twenty cities around the world. Ayça Çubukçu illuminates the tribunal up close, both as an ethnographer and a sympathetic participant. In the process, she situates debates among WTI activists—a group encompassing scholars, lawyers, students, translators, writers, teachers, and more—alongside key jurists, theorists, and critics of global democracy. WTI activists confronted many dilemmas as they conducted their political arguments and actions, often facing interpretations of human rights and international law that, unlike their own, were not grounded in anti-imperialism. Çubukçu approaches this conflict by broadening her lens, incorporating insights into how Amnesty International, Human Rights Watch, and the Iraqi High Tribunal grappled with the realities of Iraq’s occupation. Through critical analysis of the global debate surrounding one of the early twenty-first century’s most significant world events, For the Love of Humanity addresses the challenges of forging global solidarity against imperialism and makes a case for reevaluating the relationships between law and violence, empire and human rights, and cosmopolitan authority and political autonomy.